Why I am particularly interested about this? Well, partly because I am majoring in biology and have taken a whole course about lower invertebrates such as jellyfish and other slimy animals, but the huge part is because of the huge capability this animal presents to the scientific world! If scientists could discover the mechanism of this reversion of cells, this can advance the medical field tremendously, possibly by regenerating failing organ cells such as liver cells, heart cells or even brain cells. Here's the original post from the Mother Nature Network (check this article about the animals with the longest life span, very interesting), via Maurice Salem. The key lies in a process called transdifferentiation, where one type of cell is transformed into another type of cell. Some animals can undergo limited transdifferentiation and regenerate organs, such as salamanders, which can regrow limbs. Turritopsi nutricula, on the other hand, can regenerate its entire body over and over again. 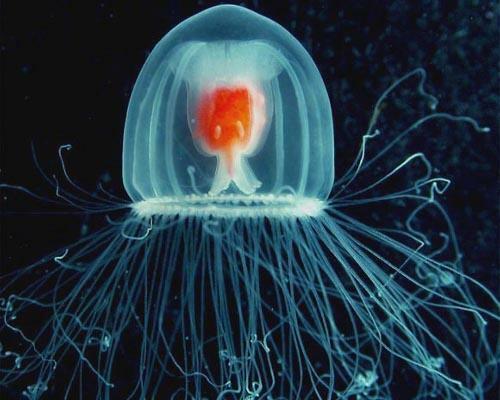 Researchers are studying the jellyfish to discover how it is able to reverse its aging process. Because they are able to bypass death, the number of individuals is spiking. They're now found in oceans around the globe rather than just in their native Caribbean waters. "We are looking at a worldwide silent invasion," says Dr. Maria Miglietta of the Smithsonian Tropical Marine Institute.